Merville resident Tarah Millen is halfway through a three-month stint in the Faroe Islands where she has been leading a Sea Shepherd Conservation Society campaign to expose a ritualistic slaughter of pilot whales and dolphins. The slaughter occurs mainly during summer months in communal drive hunts that locals call grindadráp — otherwise known as the grind. The society calls it mass slaughter. 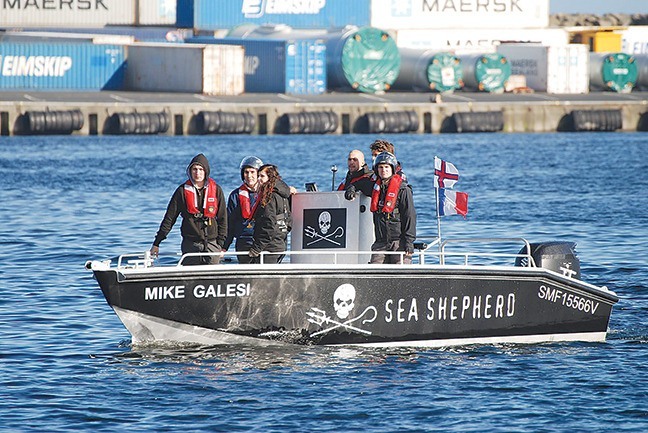 There are four Sea Shepherd teams stationed in the Danish-owned islands, located in the North Atlantic between Iceland and Norway. Millen is leading a campaign in the capital city of Tórshavn. Doctors advise women and children not to eat pilot whale because it is high in mercury, she added. The Operation GrindStop campaign has generated 600 applications from volunteers in 20-plus countries. Sea Shepherd volunteers are used on land and at sea from June to September. They monitor grind bays, deter dolphins from shore and, if necessary, intervene against a grind. Though no one has been hurt since Sea Shepherd founder Captain Paul Watson led the first campaign in 1985, volunteers put themselves in harm’s way if they need to position themselves between whale killers and whales. “A lot of it is pride,” said Millen, noting locals don’t appreciate Sea Shepherd telling them what to do. At the same time, the younger generation is speaking out against the grind. If locals interacted with whales beyond killing them, Millen said they would realize there’s more to the mammal than meets the eye. Without Sea Shepherd’s presence, Millen figures the usual number of whales are killed. The society estimates about 1,000 long-finned pilot whales are killed each year in the Faroes. The campaign, however, has reached a point where it has people on the ground for four months straight. Millen developed an environmental interest in high school after hearing a presentation about Watson. On three occasions, Millen has been to Taiji, Japan to document the drive hunt of dolphins and the slaughter of porpoises. She and partner Ryan Hughes have also ventured to the Galapagos Islands where they dismantled illegal fishing equipment and monitored an illegal marlin fishing tournament. They also helped prepare the Bob Barker for the Antarctic campaign in 2011 and 2012. All of these were Sea Shepherd campaigns.